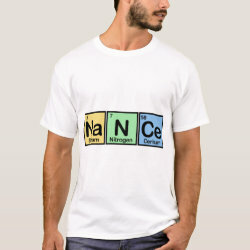 Nance made of Elements Baby Fine Jersey T-Shirt: Every new parent understands the importance of infant clothing that's a breeze to take on and off. With a neckband designed for easy on-and-off, this baby rib short-sleeve lap T-shirt is ready for whatever may come its way, from diaper mishaps to spit ups. This basic cotton T-shirt is perfect for tummy time, snuggle time and pretty much anytime. Check out other products with this design or view all apparel.